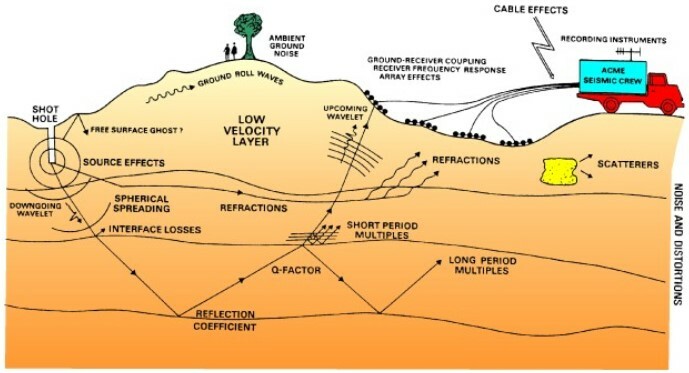 Reflection seismic is currently the primary geophysical technique in onshore exploration for natural resources, particularly in geological settings where the subsurface is characterized by a flat to moderately dipping ‘layer cake’ stratigraphy. Under the right circumstances, the image of the deep subsurface provided by seismic reflection is both clearer and more detailed than what can be achieved with other geophysical methods. Yet there are still significant challenges during acquisition, processing and interpretation of land seismic data, which influence the quality of both data and interpretations. Determine the lithologies at surface, steepness of slopes and roughness of the terrain during the planning phase for the acquisition of land seismic surveys. Improve the characterisation of the heterogeneous near-surface layer, as well as help construct velocity models that make sense geologically, for the processing of seismic reflection data. Increase geological understanding during interpretation in areas only covered by sparse 2D seismic lines, or poor-quality seismic data. Connect structures detected in individual seismic lines with each other along the surface. Use the orientations and thicknesses of stratigraphic units at surface to build cross-sections and model geological structures into the subsurface. The focus of this article is on geological mapping of RS data to provide an accurate characterization of the near-surface layer, and use this information for the (re)processing of seismic reflection data. As figure 1 shows, the acquisition of a land seismic survey leaves marks behind at the surface, which are visible from space. The image shows part of Egypt’s Western Desert, where a seismic survey was acquired along a grid of N-S and E-W oriented lines. If, at the beginning of a reprocessing project, uncertainty exists about the geographical details of the survey, RS data can help determine this information. As long as the acquisition dates are known, the exact location of seismic lines and the approximate elevation values of shots and receivers can be extracted. Archives of satellite data go back to the 1970s, and archives of aerial photos go back even further. Besides the acquisition grid, the image of the Western Desert also shows significant variations in the surface geology (figure 1). The same tectonic activity that leads to the formation of petroleum systems, causes the near-surface to be made up of a variety of different lithologies and geomorphological landforms. In most onshore regions, the surface geology is characterized by a combination of erosional areas, with relatively old, hard rocks in outcrop, and sedimentary areas, where relatively young, unconsolidated sediments cover the older, underlying strata (figure 2). The transitions between these areas can either be sharp boundaries (for example a fault that juxtaposes old rocks against unconsolidated sediments) or gradual shifts (e.g. an alluvial fan with conglomerates and gravels near steep slopes, shifting into finer grained deposits in the distal parts). Other factors, such as intensity of weathering, differential compaction of recent sediments and the depth of the water column, further impact the complexity of the near-surface. This complexity is reflected in steep gradients in the physical properties of the shallow subsurface, both vertically and laterally. These properties include density and elastic properties, which largely determine seismic velocities. Thus, the high level of complexity of the near-surface geology causes significant lateral and vertical variations in seismic velocities, and affects the propagation of seismic waves. It is therefore important to have accurate information about this heterogeneous part of the rock column, during seismic processing. The near-surface geology is sometimes referred to as the ‘weathered layer’ by geophysicists, even though it doesn’t necessarily coincide with the depth of geological weathering. While poor knowledge of the shallow geology is detrimental to seismic imaging of the geology at depth, current practices for understanding near-surface anomalies are generally limited to extracting information from seismic methods. These methods include shallow seismic refraction methods (such as first arrival tomography – Zhu et al., 1999), uphole velocity measurements, surface wave inversions and measurements of the stiffness and viscosity of the ground (figure 5 – Ley et al., 2006). These methods provide useful information, but they have their limitations: all are based on seismic waves, or data from the acquisition itself, and the maximum number of datapoints is limited to shot and receiver points along the lines of the seismic grid, with no datapoints in between. It would be logical to complement these methods with other techniques suitable for the detection of variations in the near-surface, which are based on external sources of information, and integrate them into the seismic processing workflow. Lithologies that are resistant against erosion form topographic highs, while less resistant lithologies and faults tend to form depressions in the topography. 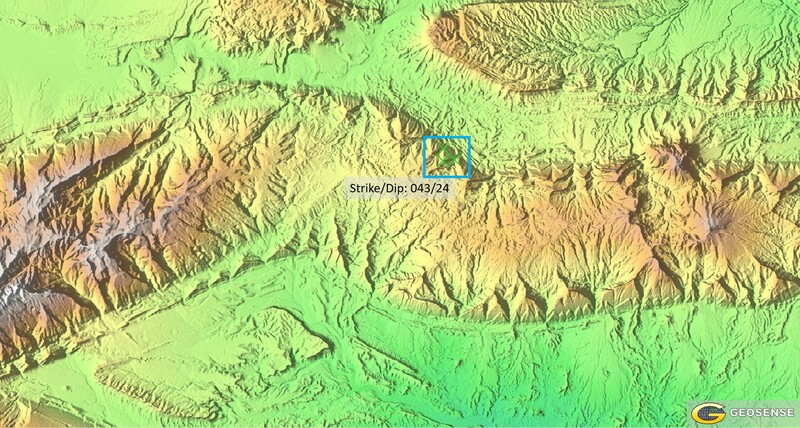 Their distribution is visible in a Digital Elevation Model (DEM – figure 4). The resistance against erosion of individual lithologies is roughly correlated with their elastic properties, which makes this information relevant for seismic processing. If not covered by vegetation, any changes in the composition of the rocks at surface results in a different reflectance spectrum from incident sunlight, as different lithologies absorb and reflect different parts of the electromagnetic spectrum. This includes parts of the spectrum outside the visible light wavelengths that our eyes are able to see, which is reflected in larger contrast between lithologies when ‘false colour’ images are used for mapping (compare figures 2 & 3). In more vegetated terrain, the vegetation type and thickness often indicate changes in underlying lithologies. Changes in permeability and weathering mechanism (mechanical/chemical) are reflected in the drainage pattern, as the behaviour of water partly depends on the lithology at surface. Limestones and evaporites dissolve in water, and weather chemically, while siliciclastic materials mainly weather mechanically, by falling apart into ever smaller pieces, upon exposure at surface. These changes are reflected in drainage patterns, which makes them visible in both imagery and elevation data (figure 4). RS data shows whether discontinuities in the near-surface are sharp or gradual, and helps determine the orientation of faults. Faults offset stratigraphic layers and the physical properties of stratigraphic units change in fault zones. 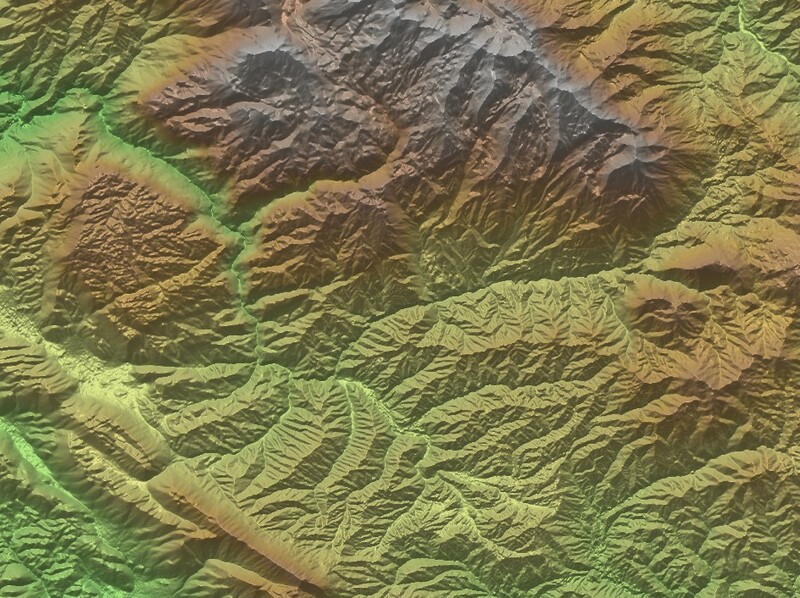 The offset layers and the changes in resistance against erosion along fault zones are often visible on RS data (elevation data and/or imagery). This information, in combination with the distribution of lithologies, helps to understand the type of boundary between different lithologies in the near-surface, as well as their orientation. Elevation data enables the measurement of bedding dips of stratigraphic layers at surface. Depending on the geological setting, this information, can be extrapolated into the subsurface and help determine the thickness of stratigraphic units and the depth of lithological changes in the subsurface. In depositional areas, recent, unconsolidated sediments form fairly flat areas, topographically lower than the older, surrounding rocks. Subtle changes in the type of sediment makes them visible on a DEM and on imagery (figure 2 & 3). In those locations where the lithology of the unconsolidated layer is roughly the same, but its thickness changes related to buried structures (faults, folds), differential compaction will leave marks at the surface. These marks include minor elevation changes, which can be reflected in the DEM and in the drainage pattern. It is inexpensive; geological mapping can be done with free, good quality RS datasets that cover the entire land surface of the globe. It provides detail; free RS data has a resolution of 10 x 10 m per pixel for imagery and 30 x 30 m for elevation data. If higher resolution data is needed, it is available for a fraction of the cost of a land seismic survey, or the (re)processing of a (historic) seismic dataset. It is quick: free data is directly available from archive; higher resolution datasets can normally be provided in days/weeks. The interpretation of the near-surface will only take a number of weeks, compared to months for big, complex (re)processing projects of 3D seismic datasets. Data is contiguous and provides continuous coverage, including in the gaps between the lines of shots and receivers. Therefore, RS datasets are able to provide more datapoints for the near-surface, and more detail on the distribution of different lithologies at surface, than the methods that are currently used. More accurate analysis of surface (Rayleigh) waves, or ‘ground roll’, and changes in the velocities of these waves, throughout the survey area. Ground roll is often considered one of the main sources of noise in land seismic datasets. An accurate understanding of the distribution of velocity anomalies throughout the surveyed area helps distinguish between signal and noise in the seismic records. Statics corrections become more consistent with the near-surface variations, because of a better understanding of the variations in this relatively low velocity part of the shallow subsurface. Static corrections mainly make up for two aspects of the data; first the elevation of seismic sources and receivers, and second the often anomalously low and highly variable seismic velocities of the near-surface layer (Cox, 1999). Having accurate information on the distribution of different lithologies and faults in the near-surface, and indications of the thickness of unconsolidated sediments, helps with the determination of appropriate statics throughout the survey area. Near-surface variations are a possible source of residual amplitude variations, after despiking. The surface geology helps to understand the distribution of anomalies in the residual amplitudes for shot points and receivers. Understand the causes of variations in first breaks, as they correlate with the distribution of the different near-surface units that were distinguished during the surface geological mapping. Clear comprehension of the coupling with the ground of both sources and receivers; lithologies and ground conditions have a significant influence on the strength of the seismic signal, and can vary significantly over short distances. These variations are reflected in changes in ground viscosity and stiffness values that can be gathered during the acquisition, and in the ratio between them (Ley et al., 2006, figure 5). Rapid detection of the above ground causes of amplitude anomalies. More on this in a later paragraph. While the use of RS datasets to increase understanding of the near-surface is useful across different climates, this methodology is particularly beneficial in dry, arid areas (e.g. Middle East, North Africa, Neuquén Basin in Argentina). In such non-vegetated regions, low water content in the near-surface reduces the strength of the seismic signal. Yet due the lack of vegetation the surface geology is very well exposed and visible on RS data (figure 3), which makes it easier to accurately characterize the near-surface. A further effect of the absence of vegetation is the lack of soil development, which increases the presence of hard ground at the surface, and with it the likelihood of surface-related noise and multiples, when compared with soft ground in vegetated areas where soil has developed (Vestrum & Gittins, 2015). In humid regions a similar effect occurs where massive limestones are exposed at surface and soil development happens much slower than over most siliciclastic lithologies (figure 6). Combine this with the detrimental effect of karstification on seismic data and it becomes clear why it is so hard to acquire good quality seismic data in PNG and parts of Indonesia, and other parts of the world with significant amounts of limestones at surface. Besides the previously described causes of anomalies in seismic amplitudes below the surface, there are above ground reasons for noise as well (figure 7). Many sources of noise are the result of human activities, such as the presence of roads, pipelines, powerlines and other infrastructure, or activities that increase the water content in the near-surface in otherwise dry areas, such as irrigation (figure 8). The visibility of these features on satellite imagery enables a quick understanding of localized noise and amplitude changes in the unprocessed data. Early detection of sources of seismic noise is beneficial during processing projects, and another good reason to use information derived from satellite data throughout the processing workflow of land seismic data. Geological mapping with RS data for the processing of land seismic data leads to a better understanding of variations in the heterogeneous near-surface. The changes in physical properties that affect seismic velocities in the near-surface are often reflected in the terrain, and can therefore be mapped accurately by geologists that are experienced in working with RS data. Other information provided by the same datasets helps to quickly recognize above ground sources of noise. Incorporating this information into the seismic processing workflow will result in improved seismic data and a clearer image of the subsurface, which enables more accurate interpretations of the geological setting at depth. While useful in any climate, this is particularly beneficial in dry terrain, where the geology is much more exposed at surface, and the lack of soil development is detrimental to the seismic signal. A similar effect occurs over areas of massive limestone outcrops in vegetated terrain. During onshore O&G exploration, some of the biggest expenses of the work program include the acquisition, processing and interpretation of seismic data. The current environment of constrained exploration capital is a good moment to look at alternative, inexpensive ways of improving the quality of seismic data, both during the processing of new, and the reprocessing of legacy seismic data. The method explained in this article will quickly help improve seismic data quality for a fraction of the cost of a typical (re)processing project, and seems like an obvious step forward. A future article will focus on the use of geological mapping with RS data for seismic processing and interpretations specifically in fold and thrust belts. To understand the geological setting and tectonic history of a region, it is important to start with observations, spread out over the area of interest. Dip directions of sedimentary layers (and layered volcanic rocks) are amongst the most important observations for understanding the geology of an area, together with the structures (faults, folds, foliation, unconformities, etc.) that help understand how the stratigraphic units have been deformed. Measurements of the orientations of layered rocks are generally taken by field geologists, with a geological compass. There are two problems with this method: fieldwork is generally time-consuming and costly, and the access that is required to take such measurements is in many occasions limited, or risky. Fortunately, there are alternative, complementary ways to obtain reliable and accurate information on the orientations of sedimentary layers, using remote sensing data. The continuously increasing quality and resolution of available Digital Elevation Models (DEM) and imagery allows geologists to calculate many, accurate strike and dip measurements, covering large regions quickly. It facilitates the quick measurement of many accurate dips over a large region. A remote method, useful during the preparation of fieldwork in areas of difficult access or a short field season (arctic areas, thick jungle regions with limited infrastructure, areas with heavy rain during parts of the year, areas with significant safety risks, mapping before permits are received, etc.). In such areas good preparation is vital, to make sure that the limited time in the field is spent in the right locations. Determination of bedding dip in locations that are hard to reach due to rugged terrain and steep slopes. Measure dip direction at a sufficiently large scale that local distortions (caused by cross-bedding, near-surface movements due to ongoing erosion, etc.) do not affect the accuracy of the measurements. Quick determination of the location of fold hinges, and the geometry of folds, important for natural resource exploration (anticlines for hydrocarbon accumulations and numerous mineral deposits, synclines for groundwater aquifers). Improved understanding of the subsurface, as the surface geology reflects the geometry of the geological setting in the subsurface. Combining dips measurements with the determination of layer thicknesses provides useful inputs into cross sections and 3D geological models. More measurements, earlier on in the work program, to help understand the geological setting and tectonic history. The accurate measurement of the dip direction of stratigraphic layers from elevation data relies on the recognition and accurate calculation of the orientation of stratigraphic layering in remote sensing datasets. Textbook examples of bedding dips that can be measured are flatirons; erosion-resistant layers limited by valleys on either side, forming a triangular shape that stands out in the terrain (figure 1). Geologists with significant experience in using remote sensing data for geological mapping are able to recognize layers that have a much smaller surface expression, and measure strike and dip from much subtler features in the terrain. An explanation of what is measured and calculated when using this method: GIS software shows geographic location as X and Y coordinates (figure 2), the DEM adds the third, vertical dimension, turning each geographical point into a point in 3D space (X, Y, Z – figure 3). The geologist picks three points that are all part of the same stratigraphic layer (at its intersection with the surface) and the software calculates the orientation of the plane in 3D space by resolving the ‘three point problem’ (figures 1, 3 & 4). Just like in the field, the accuracy of the end result depends on the ability of the geologist to recognize the surface expression of stratigraphic layering. The difference is the top down perspective and overview of a large region, rather than the outcrop scale in the field. Therefore, the ability to recognize these often very subtle surface features requires a solid experience in the geological interpretation of remote sensing data. While elevation data provides the information needed for the calculation of bedding dip directions, it should be combined with imagery to aid the recognition of individual layers. Some layers are obvious enough in the elevation data, while others are more apparent in the imagery, due to the changes in spectral signature between different lithologies. For this method to provide accurate results, it is important to recognize faults that displace layers, as fault offset between the three points used for the measurement would distort the outcome. Just like with stratigraphic units, some faults are more apparent in elevation data, while others are more visible in imagery. 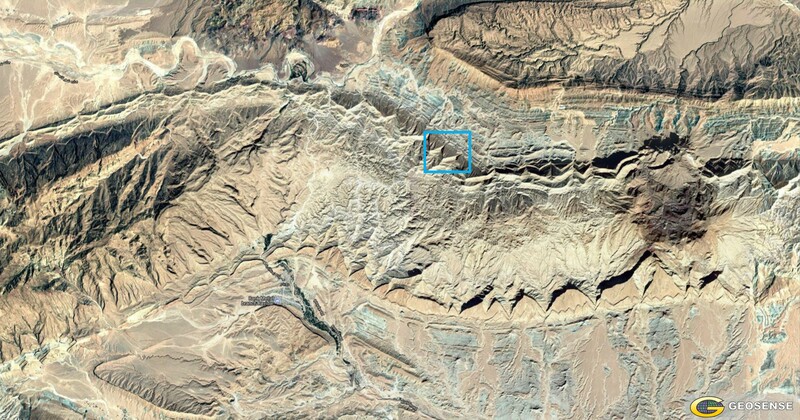 For the example from the Zagros Mountains (figures 3 & 4) a 30 meter resolution DEM was used. Many higher resolution datasets are currently available, some derived from satellite data, others acquired by airplane (e.g. LiDAR) or drone (e.g. photogrammetry). These datasets enable the recognition of more dips, with increasing confidence in the accuracy of the measurements, as the spatial resolution increases. High resolution DEMs make it possible to detect the subtle topographic surface expressions of sedimentary beds, which are just too small to appear on coarse, low resolution elevation data. Under the right circumstances, the highest resolution elevation datasets even allow for the measurement of the orientations of planar features other than bedding strike and dip, such as fault planes, veins and dykes. The increasing availability of very high resolution remote sensing data only expands the possibilities for their use in detailed geologic mapping, particularly at scales at which most regions haven’t been mapped before. Modern digital elevation datasets allow for the measurement of the orientation of bedding strike and dip (and under the right circumstances other planar features) in 3D space, through the resolution of the three point problem in GIS software. This allows for the quick and accurate measurement of many dips over a large region. This remote method is particularly useful in regions were access is difficult or limited, and provides quality information during the preparation of fieldwork and in areas where structural data is scarce. High resolution DEMs enable an increase in the number and accuracy of dip measurements. A geologist controls the algorithm, therefore the quality of the measured dips is related to the ability of the geologist to recognize the surface expression of stratigraphic bedding (and other planar features) in remote sensing datasets. The method described in this article is part of the core expertise of Geosense, and is part of any geological mapping projects in areas where accurate knowledge of the bedding dip direction benefits the geological understanding of the mapped region. Many giant ore deposits are known to be located in the vicinity of trans-lithospheric structures. The presence of such deep structures, while not a guarantee, seems to be a prerequisite for the development of sizable ore deposits of many types (e.g. Richards, 2003; McCuaig & Hronsky, 2014; Groves & Santosh, 2015). These structures commonly form key pathways (or plumbing systems) for vertical migration of magmas and mineralized fluids through the crust. 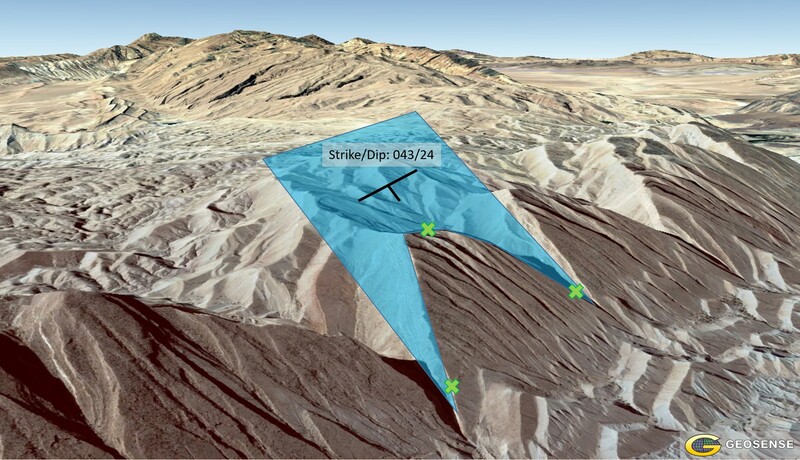 In mineral exploration, the importance of predictive targeting keeps increasing, relative to the detection of possible signs of the presence of mineralization. Therefore, the importance of recognizing deep structures also keeps increasing, particularly during early, regional scale exploration (figure 1). Mapping the locations of fundamental lithospheric structures is essential to reducing the size of target area(s), where further exploration should be focused. Figure 1: The mapping of fundamental basement structures is particularly relevant during broad regional exploration (left-hand side of diagram), in the early stages of generative exploration programs (McCuaig et al., 2010). A well-known example of these large-scale ore-controlling structures is the NE-SW oriented Querococha Arch structure (Love et al., 2004) that runs through Antamina, in Peru (figure 2). Other examples of world-class deposits where similar types of structure have been mapped include: Grasberg, OK Tedi and Porgera (New Guinea, see e.g. Hill et al., 2002; Garwin et al., 2005), numerous ore deposits in NW Argentina and N Chile (e.g. Chernicoff et al., 2002; Richards 2003), the Kalgoorlie Super Pit (Yilgarn Craton, West Australia, see e.g. Mole et al., 2012) and several others in Australia (McCuaig & Hronsky, 2014). Possibly the most famous examples of fundamental basement structures that control the locations of giant ore deposits at a regional scale are the Carlin and Battle Mountain-Eureka Trends in the Great Basin of the western US (Grauch et al., 2003). Figure 2: Region around Antamina mine, Peru (yellow arrow). The strike-extensive Querococha Arch structure that runs through the Antamina deposit causes significant deformation along its trace. Deformation changes are most apparent in the area 200 km NE from Antamina (blue box), within the Sub-Andean Fold-Thrust Belt, where obvious changes between deformation geometries on either side of the structure occur (Elevation data used: AW3D30 DEM). Strike-extensive. When mapped, these structures are significantly longer than the average fault in the same region. Depth-extensive (they often reach the lithospheric mantle) with relatively steep dips (as imaged in geophysics). This means they are often fairly straight in map view. Commonly juxtapose distinctly different basement domains. Multiply-reactivated during different phases of deformation. The sense of movement of these structures upon reactivation depends on the orientation of the prevailing stress field. These structures often undergo variable senses of movement throughout their very long geologic history. Vertically-accretive growth histories. Undisturbed younger sedimentary/volcanic deposits (or obducted rocks) can cover the structure during periods of inactivity, but upon reactivation of the underlying structure, such deposits tend to deform along its’ trace. When this deformation succeeds, the basement structure propagates upwards and continues its’ vertical accretion (figure 3). These are not necessarily obvious structures at or above the level of mineralization, they can be ‘cryptic’ (hard to see at current erosional levels). The reason for this is that deformation close to the surface is only a reflection of the most recent movement(s) along the structure. In most cases the deeper basement, which has seen larger/multiple/variable movements, isn’t exposed at surface. For this reason, these structures are difficult to recognize when out in the field and have often been missed by geological surveys, or only mapped along part of their trace. Yet during regional exploration, these are the most important structures to try and map, as they are fundamental for targeting more focused exploration work. Figure 3 shows the upward propagation of a fundamental basement structure after the deposition of sediments and/or volcanic rocks above it in a tectonically inactive environment. The diagrams explain why the movement of these large faults often seems relatively small and their surface expression cryptic. While the example in figure 3 is valid in many cases, it is important to realize that, during periods of basin formation, fundamental basement structures are often active rather than inactive. The (oblique) extensional stress field under which the formation of most basins initiate is more likely to reactivate large, steep pre-existing weaknesses (if their orientation is favorable, relative to the orientation of the stress field), than it is to form new ones (e.g. Daly et al., 1989; Morley et al., 2004). The vertical (or oblique) movement along fundamental basement structures during deposition of sediments in the newly formed basin causes changes in thicknesses and facies in the sedimentary package. These changes follow the traces of the underlying (reactivated) structures that control them (figures 4 & 5). Figure 5: Schematic examples of changes in thickness and facies in the stratigraphic column, caused by reactivation of steep, pre-existing basement structures during basin development. If such a basin, with changes in the sedimentary package across fundamental basement structures, undergoes significant deformation at a later stage in geologic history, the changes in sediment thickness and facies will have an effect on the deformation style and geometry. If the basin undergoes compression (or transpression), the changes in the stratigraphic column lead to changes in frequency of faults (figure 6), differences in wavelengths of folds (figure 7), changes in dip of flanks of synclines and anticlines and changes in depth, lithology & thickness of detachment levels (again causing changes in frequency, amplitude & geometry of folds, or in more extreme cases changes from thick-to thin skinned tectonics). Lateral ramps in orogenies are a common example of a relatively shallow feature, caused by deeper underlying structures. At surface, these structures are often mapped as strike-slip faults, although in three dimensions, the structural setting tends to be more complex (figure 6). Figure 6: Location of the basement fault, and the resulting changes in sediment thickness and/or facies, results in changes in deformation style and geometry of the overlying sedimentary package (Turner et al., 2010). The location of the changes in detachment levels overlies the reactivated basement structure, as this structure controls the changes in the stratigraphic column (figures 5 & 6). Working backwards, the described changes in the surface geology, are a reflection of significant underlying changes at depth, and thus indicate the presence of fundamental basement structures. Some of these changes can be recognized and mapped with satellite data. As the location of fundamental basement structures is so important during generative grassroots exploration programs, to help reduce the size of target areas where more detailed exploration should be focused, the ability to recognize them is essential. Currently, their presence is often confirmed through tectono-stratigraphic reconstructions and geophysics. The recognition through reconstruction of a detailed tectono-stratigraphic framework relies on sudden changes in facies and thickness within the sedimentary package of a basin, due to activity of basement structures during their deposition (as explained above). The detection through geophysical methods depends on activity along the basement structures juxtaposing different lithologies (close to the surface and/or at depth), each with different physical characteristics, which are reflected in the geophysical data. Abrupt changes in the frequency of faults and folds at surface. Sudden changes in wavelengths of folds along strike. Numerous folds terminate along the surface trace of the basement structure. Increased presence of igneous rocks (granites, dykes, volcanoes). Igneous rocks of different ages have been recognized along these structures. If mapped by geological surveys along parts of their surface trace, they are often interpreted as simple strike-slip faults. The NE-SW oriented Querococha Arch structure that crosses Antamina shows good examples of several mappable elements, some of which occur in the area around the mine. Individual anticlines, synclines and thrusts terminate, or bend, across the trace of the structure, as a result of changes in the underlying stratigraphic package (figure 7). When zooming out further, it becomes clear that the entire Marañon fold-thrust belt steps to the right around the NE-SW fundamental basement structure (figure 8). Even more profound than the changes near Antamina are those in the surface geology 200 km to the NE (figure 8). 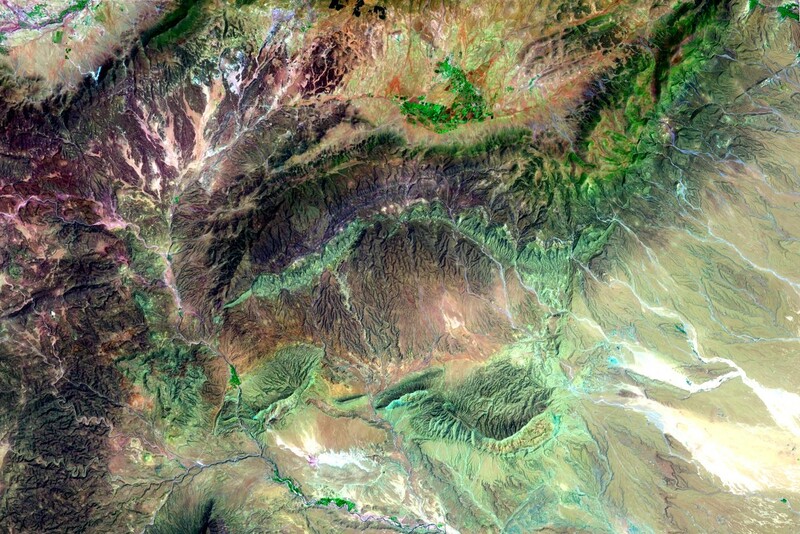 East of the 76°W meridian (black N-S line through purple box in figure 8) the NE-SW fault runs through a river valley that separates two parts of the Sub-Andean Fold-Thrust Belt, each with a distinctly different geometry. On the northern side, the older lithologies (Mesozoic) are exposed in the western part of the uplifted range, while folded Cenozoic sediments crop out along the eastern limit of the up-thrusted block. To the south of the NE-SW valley, the bulk of the up-thrusted Mesozoic lithologies are exposed at surface in the eastern part of the block, while to the west mainly Cenozoic units are found in outcrop. Another clear difference is the presence of a significant west-verging thrust to the north of the fundamental basement structure, while no thrust with that vergence has been mapped to the south. As a result of the difference in resistance against erosion of the various lithologies found at surface, elevation data clearly reflect the changes in deformation geometry, across this vertically accretive basement structure (figure 2). Figure 8: Dark red arrow indicates location of the Antamina mine, in a zone where the (green colored) Marañon Fold-Thrust Belt steps to the right. Purple box in NE indicates same area as blue box in figure 2, where the geometry of the Sub-Andean Fold-Thrust Belt completely changes from N to S, across the NE-SW fundamental basement structure. Excerpt from Geological Map of Peru (scale 1:1.000.000), published by INGEMMET Peru. The parts of fundamental basement structures that do not show displacement at surface as significant as the examples shown above (schematically shown in figure 3), commonly form subtle lineaments, which extend for 10s – 100s of kms. These can often be mapped with satellite data too; in some parts they are more evident in the elevation data, while in other areas they are more clearly visible on the imagery, depending on the nature of the subtle deformation of the lithologies at surface. However, it is important to know what to look for, and significant experience in mapping geology with satellite datasets allows for the detection of the subtle surface expression of deep structures that others would be unable to recognize. Geosense has built this expertise through the geological mapping of large regions for exploration projects around the globe. Nowadays, the resolution of freely available imagery and elevation data is sufficient to map large fundamental basement structures in most geologic settings. Such satellite datasets can be obtained easily, directly from archive, with choice from a variety of imagery options (e.g. Sentinel 2 data – up to 10m resolution, and Landsat and ASTER, both up to 15m) and DEMs -digital elevation models (e.g. SRTM and AW3D30 – both 30m resolution). These datasets provide a uniform, unbiased, global coverage at a higher resolution than any other global datasets, which makes satellite data excellent for use in continental/province scale exploration programs. 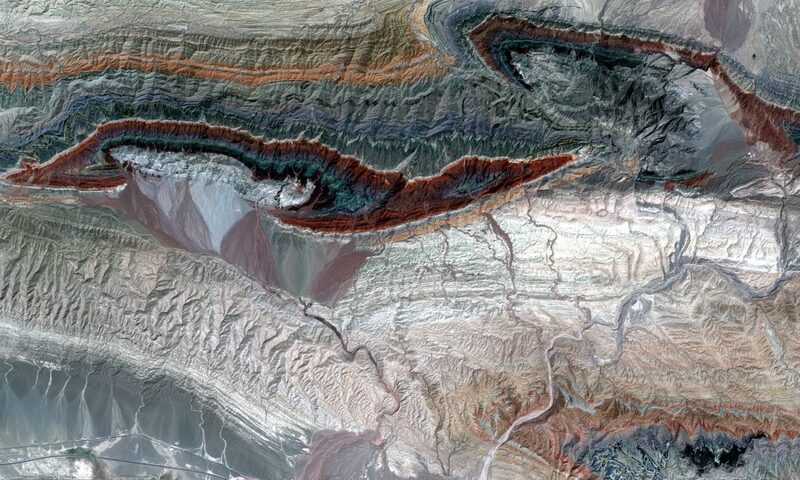 Large ore deposits of many types are commonly found in the vicinity of deep structures. Knowledge about the locations of these structures is relevant during the regional exploration programs. Basement structures are commonly reactivated during the early (extensional) stages of basin development. Subsequent deformation often results in the development of mappable features along the trace of the basement structures, due to changes in the sedimentary columns on either side of the structure. While fundamental structures extend over large distances, their surface expression tends to be very subtle along parts of their trace. Recognizing and mapping these structures can be a challenge, and one needs a skilled structural geologist with ample, relevant experience in photogeology, who can translate subtle geomorphological changes into valuable structural information. Geosense has this experience, and offers this service to exploration teams working on regional greenfields exploration programs worldwide. As the data itself is free, the cost of this method is low, when compared to other methods for recognizing fundamental basement structures. This makes it an ideal method during regional generative exploration, to help determine areas where more detailed and more costly exploration methods should be focused. 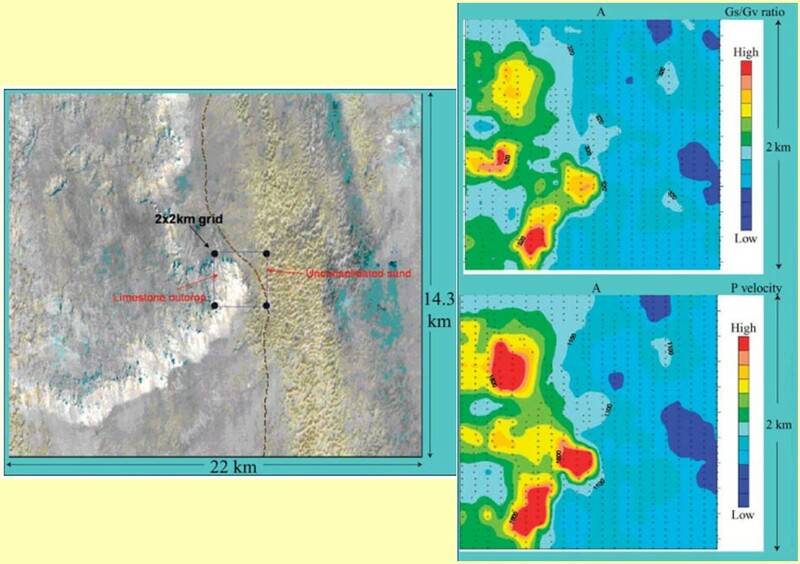 Chercnicoff, C.J., Richards, J.P. and Zappettini, E.O., 2002, Crustal lineament control on magmatism and mineralization in northwestern Argentina: geological, geophysical and remote sensing evidence. Ore Geology Reviews 21-3, p. 127-155. Daly, M.C., Chorowicz, J. and Fairhead, J.D., 1989, Rift basin evolution in Africa: the influence of reactivated steep basement shear zones. In: Cooper, M.A. and Williams, G.D. (eds. ), Inversion Tectonics. Geological Society of London, Special Publications 44, p. 309-334. Garwin, S., Hall, R and Watanabe, Y., 2005, Tectonic Setting, Geology, and Gold and Copper Mineralization in Cenozoic Magmatic Arcs of Southeast Asia and the West Pacific. In: Hedenquist, J., Goldfarb, R. and Thompson, J. (eds. ), Economic Geology 100th Anniversary Volume, Society of Economic Geologists, p. 891-930. Grauch V.J.S., Rodriguez B.D., Bankey V., and Wooden J.L., 2003, Geophysical and isotopic constraints on crustal structure related to mineral trends in north-central Nevada and implications for tectonic history. Economic Geology 98-2, p. 269-286. Groves, D.I. and Santosh, M., 2015, Province-scale commonalities of some world-class gold deposits: Implications for mineral exploration. Geoscience Frontiers 6-3, p. 389-399. Hill, K.C., Kendrick, R.D., Crowhurst, P.V. and Gow, P.A., 2002, Copper-gold mineralization in New Guinea: tectonics, lineaments, thermochronology and structure. Australian Journal of Earth Sciences 49-4, p. 737-752. McCuaig, T.C., Beresford, B. and Hronsky, J.M.A., 2010, Translating the mineral systems approach into an effective exploration targeting system. Ore Geology Reviews 38-3, p. 128-138. McCuaig, T.C. and Hronsky, J.M.A., 2014., The mineral system concept: the key to exploration targeting. Society of Economic Geologists Special Publication 18, p. 152-175. Mole, D. R., Fiorentini, M. L., Thebaud, N., McCuaig, T. C., Cassidy, K. F., Kirkland, C. L., Wingate, M. T. D., Romano, S. S., Doublier, M. P., Belousova, E. A., 2012, Spatio-temporal constraints on lithospheric development in the southwest-central Yilgarn Craton, Western Australia. Australian Journal of Earth Sciences 59-5, p. 625-656. Morley, C.K., Haranya, C., Phoosongsee, S., Kornsawan, A. and Wonganan, N., 2004, Activation of rift oblique and rift parallel pre-existing fabrics during extension and their effect on deformation style: examples from the rifts in Thailand. Journal of Structural Geology 26-10, p. 1803-1829. Richards, J.P., 2003, Tectono-Magmatic Precursors for Porphyry Cu-(Mo-Au) Deposit Formation. Economic Geology 98-8, p. 1515-1533. Turner, S.A., Cosgrove, J.W. and Liu, J.G., 2010, Controls on lateral structural variability along the Keping Shan Thrust Belt, SW Tien Shan Foreland, China. Geological Society of London, Special Publications 348, p. 71-85. A previous version of this article has been published on LinkedIn. At Geosense, we use earth observation data to help companies with their exploration efforts, through geological remote sensing projects. As such, we often come across geologists who use satellite data, but don’t closely follow the advances that happen in the remote sensing world. Many are aware of some of the more commonly used datasets, but not of newer, less well-known options. Therefore, they fail to see possibilities that open up when these newer datasets are used. An important attribute of any remotely sensed dataset is the spatial resolution, but from conversations with clients it is clear that many people misunderstand how much of a difference this aspect makes. This article will try to the importance of spatial resolution, by looking at a number of Digital Elevation Models (DEMs). The resolution of remote sensing data is generally indicated by a single number. Let us, for example, take a look at the resolution of the SRTM DEM, which is probably the most commonly used DEM out there (freely available through the United States Geological Survey). Up until 2014, global coverage of the SRTM DEM was available at a 90m resolution. Since then the 30m version of the same elevation model has been released for the entire globe. But what do these resolution numbers stand for? We can start to see what is meant when we zoom in beyond the maximum (or native) resolution of a dataset. We now see a pixelated view of the image, because every square-shaped point in the data is covered by multiple pixels on the screen. If we zoom in even further, the data turns into numerous squares. Figure 1 shows actual SRTM DEM data, zoomed in far beyond the maximum resolution, with 90m data on the left, and 30m data on the right. 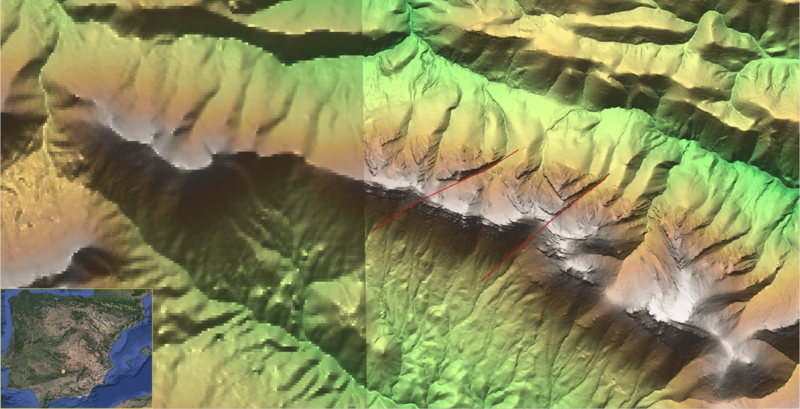 Figure 1; This is what SRTM data looks like when zoomed in far beyond the maximum resolution, with 90m data on the left, and 30m data on the right. 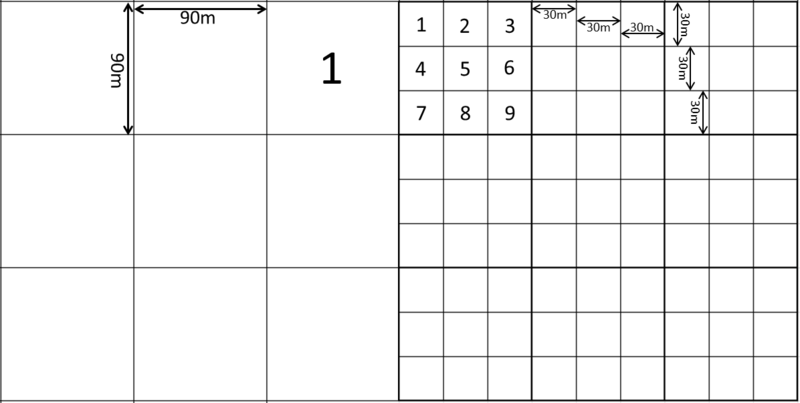 Figure 2 shows what the square shaped pixels would look like, if we were to visualize the difference schematically. Figure 2; Schematic overview of the change between satellite data with a 90m spatial resolution (left), and data with a 30m resolution (right). What figures 1 & 2 show is that the spatial resolution is measured by taking the length of a side of one of the square-shaped data points. Simply put, the resolution number refers to only one side of a square. There is another side with the same length as well. For the SRTM example, the former 90m spatial resolution was in fact 90m x 90m, while the current 30m is really 30m x 30m. By making some simple calculations, we can start to better understand the importance of spatial resolution: each data point was 90m x 90m, or 8100m2, and it has changed to 30m x 30m, or 900m2. Figure 2 shows visually how big this difference really is. Each data point at a 90m resolution is covered by 9 data points at a 30m resolution. What this means is that 30m data is not just three times better than 90m data (as the individual resolution number would make you believe), but nearly an order of magnitude better. Nearly an order of magnitude more data, which means nearly 10 times as much information for the end user. The higher resolution data gives you much more detail over the same area. With this dataset it is possible to detect features that were too small to appear on the lower resolution data and the confidence in the information and interpretations that you derive from your data increases significantly. Figure 3 shows an example at a more commonly used zoom level. It is again SRTM data at two different resolutions (90m & 30m), over an area along the border between Croatia and Bosnia-Herzegovina (see figure 4 for location). This image clearly shows that the lower resolution data (along top and right-hand side of image) is much more pixelated, and that the higher resolution data provides much more detail to the user. With regards to geology, details such as coarse layering of the exposed bedrock, minor faults that only have a small offset of the layers, small streams that erode their way into the bedrock and subtle changes in the direction of a river are all captured in the 30m data, while they remain invisible in the 90m data. These aspects are all very useful information when making a structural interpretation of an area, as they allow for a more accurate overall understanding of the structural setting of the area, and for the mapping of an increased number of individual structures during the interpretation. These aspects can be very important, for example when trying to understand the structural setting at the time of mineralization. Figure 3; SRTM data over an area along the border between Croatia and Bosnia-Herzegovina. The clear data (center, left & bottom) is 30m data, while the fuzzy data (top & right of figure) is 90m data. ALOS World 3D (AW3D) 5m data. A huge improvement over 30m data, and very cost effective compared to most other options. WorldDEM (from Airbus) 12m data. A DEM derived from radar data. While more expensive than AW3D 5m data, when working in heavily vegetated terrain this can be a better option, as the cloud cover often affects DEMs derived from imagery (such as AW3D). Even under those difficult circumstances, WorldDEM provides a high vertical accuracy. For applications that need an even higher resolution (~1m and beyond), multiple options are available, mostly derived from Very High Resolution (VHR) imagery (such as WorldView, Pleiades, GeoEye, etc.). Of course, these higher resolution datasets come at a cost; generally, datasets get more expensive, the higher the spatial resolution becomes. But in most cases, you would also use them for different applications, over smaller areas. For applications that need a level of detail beyond the limit of currently available satellite elevation data, airborne acquisition techniques are available (LiDAR or UAV (drone) based photogrammetry). Advantages of using airborne technologies over satellite-based datasets are the increased flexibility (acquisition date and time of day, flight spacing and direction, revisit times, etc. ), and the possibility to acquire data at an angle (particularly useful in areas with steep slopes). In the case of LiDAR, specific processing methods can strip away the vegetation cover. This is very useful for geological mapping in vegetated terrain, as the end result is an elevation model of the surface beneath the trees, rather than the top of the canopy. Depending on your area of interest, it is worth checking public sources of local remote sensing data, as some governments make high resolution elevation data over their country freely available. One example is Spain. In figure 4, we compare 30m data acquired by satellite (AW3D30), with 5m data from the Instituto Geográfico Nacional (IGN) that is derived from an airborne LiDAR survey (PNOA). 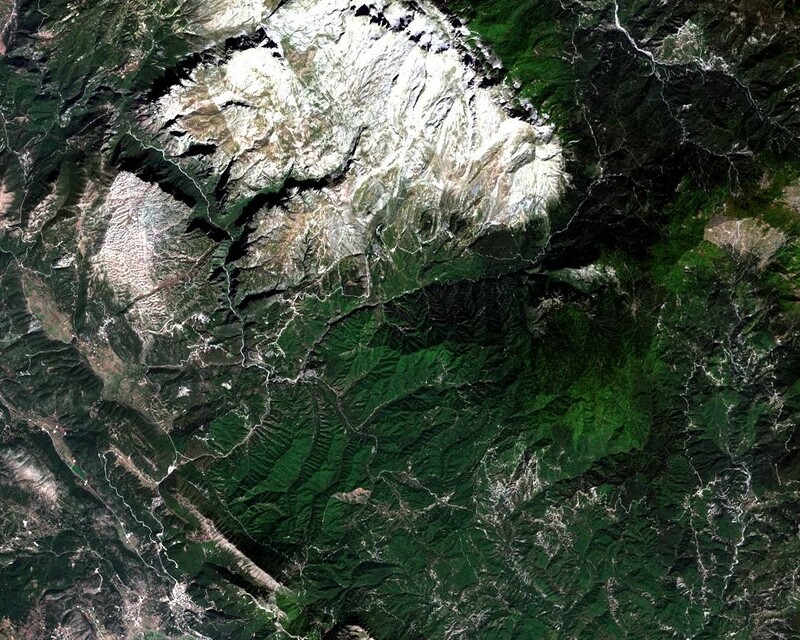 In this area in Central Spain, individual features such as stratigraphic layering are clearly visible on the 5m data, while the 30m data only shows the general trend of the mountain ridge. Some of these individual layers have a clear flat-iron shape, which can be used for accurately measuring their strike and dip in some GIS software packages. Two NE-SW oriented faults offset individual layers, and their location can therefore be accurately mapped on the 5m data. Mapping these features would not be possible with the 30m data. Figure 4; Elevation data over an area in Central Spain. The difference in resolution between the 30m AW3D30 data (left) and the 5m PNOA data (right) is obvious. The higher resolution allows for much more detailed geological mapping, and the interpretation of features with only a subtle surface expression. At the speed at which changes are occurring in the earth observation sector, it is difficult for people who don’t work with remote sensing data on a daily basis to keep track. And that is a shame, because it makes it more difficult to select the most appropriate dataset for a specific application. With the rising number of satellites looking down at the earth , competition amongst satellite data providers increases as well. As in any industry, more competition means lower prices. Better quality, higher resolution satellite data is becoming available cheaper than it was before. This trend benefits the end user of the data, but also makes it more difficult to choose the right dataset. 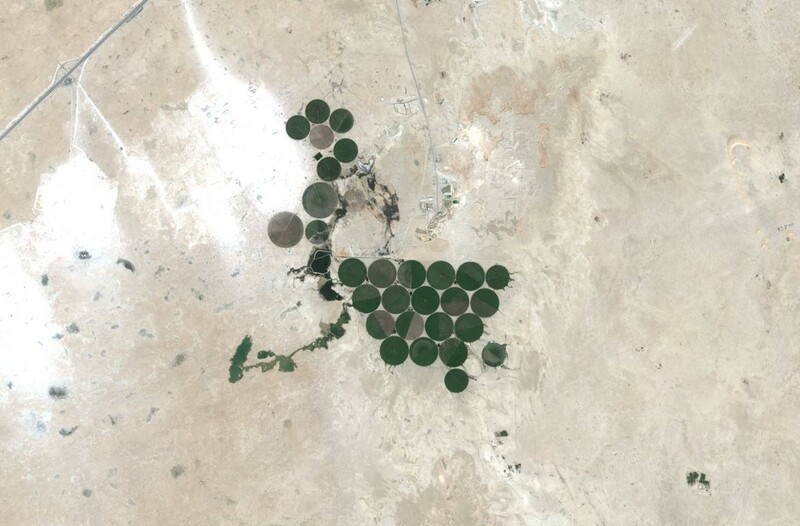 To deal with this issue it is important to get advice from people who have both an up-to-date knowledge of available remote sensing datasets, and experience in using the data for the application that the user has in mind. It would be a shame if you were unable to benefit from the ongoing advances on the technical side, simply because you are unaware of the most appropriate data options. Spatial resolution is measured along the side of a square-shaped data point. Data that has (for example) a 10m resolution has 9 times as many measurements as 30m resolution over the same area, nearly an order of magnitude more! Subtle features (such as geological structures, stratigraphic layers) can more accurately and more easily be mapped when using higher resolution data. An increased number of data providers has led to an increase in data options and accuracy for DEMs. This trend is likely to continue into the future. Geological mapping (just like many other applications) has much to benefit from the increased availability and improved resolution of elevation data. Hopefully this article has helped you gain a better understanding of the importance of spatial resolution in remote sensing data. In a future article we will look at various imagery options available nowadays, and the difference that spatial resolution makes for their users. In the meantime, if you have any questions as a result of this article, please don’t hesitate to get in touch. The image at the top of this page is of SRTM DEM data (30m on the left, 90m data on the right) over an area along the border between Croatia and Bosnia and Herzegovina (same region as figure 3).